At Mid-Ohio Foodbank, we find it unacceptable for thousands of our neighbors—most of them children and seniors—to go hungry. We aim to provide efficient, effective ways for hungry people to meet their basic food and nutrition needs. 2018 marks the 38th anniversary of the Mid-Ohio Foodbank. Although we distributed just 205,200 pounds of food in our first year, our organization now handles more than 66 million pounds annually. Through our 680 agency partnerships, we provide more than 140,000 meals every day to hungry people across central and eastern Ohio. The Operation Feed Foodbank opened its doors in April, distributing 205,200 pounds of food in the first year. The Operation Feed Foodbank moved to a 10,000 square-foot warehouse. The Operation Feed Foodbank joins forces with other food banks around the country as a member of Second Harvest (now Feeding America). The Foodbank also held its first community-wide food and funds drive (now called Operation Feed). The first WBNS Food Parade was held. Operation Feed became the Mid-Ohio Foodbank and moved to a larger warehouse on West Mound Street. Nine and a half million pounds of food were distributed that year. A formal volunteer program and a food reclamation program (to keep good food out of landfills) were created. The Foodbank distributed 11 million pounds of food and received the National Award for Excellence in Food-banking. A key grant from the UPS Foundation allowed the Foodbank to start its Second Servings program. The first Mid-Ohio Foodbank Golf Classic was held. The Foodbank participated in Operation Desert Share, distributing post-war surplus food from Desert Storm. The Foodbank developed a rural development program. The Foodbank hosted the Second Harvest Central Region Food Bank Conference. The Rising to Meet the Need capital campaign raises $3 million to refurbish the Mound Street warehouse. The Foodbank received an award from the Congressional Hunger Center and founded Produce Express. The Foodbank begins agency delivery service and forms its Agency Council. The Foodbank begins its Weekend Take-home Groceries/BackPack program. The Foodbank begins offering online ordering for agencies and a Mobile Market to deliver groceries and fresh produce. The Foodbank distributed 28.6 million pounds of food this year. The Foodbank participated in the quadrennial Hunger in America Study. The Foodbank was certified by the Ohio Association of Nonprofit Organizations for meeting its Standards of Excellence requirements, and received the Better Business Bureau Charity Accreditation Seal. The Foodbank launches its $16 million Campaign to Sustain capital campaign to fund its current facility in Grove City. The Foodbank moves into its current facility. The Foodbank distributed over 40 million pounds of food for the first time. The Kroger Community Food Pantry opens, allowing the Foodbank to gain hands-on pantry experience, while helping to build capacity for its network, now more than 550 agencies strong. Learn about the people receiving help, the work that makes it possible, and how you can get involved by reading our most recent publications. NewsFeed – a quarterly newsletter highlighting the work of the community and the people helped. 2018 Annual Report – A review of the past year in stories and financial information. To ensure that hungry people have consistent access to nutritious food, the Foodbank sources, procures, processes and delivers food and grocery products from private donors, the food industry, local farmers and the state/federal government to emergency and non-emergency feeding programs. Through our partner network of over 650 not-for-profit partner agencies across 20 Ohio counties, we are able to work together to effectively respond and support the unique hunger challenges facing Ohio communities. Through these partnerships, Mid-Ohio Foodbank distributes more than 60 million pounds of food each year. Click on the link below for information on how to become a Mid-Ohio Foodbank member agency. 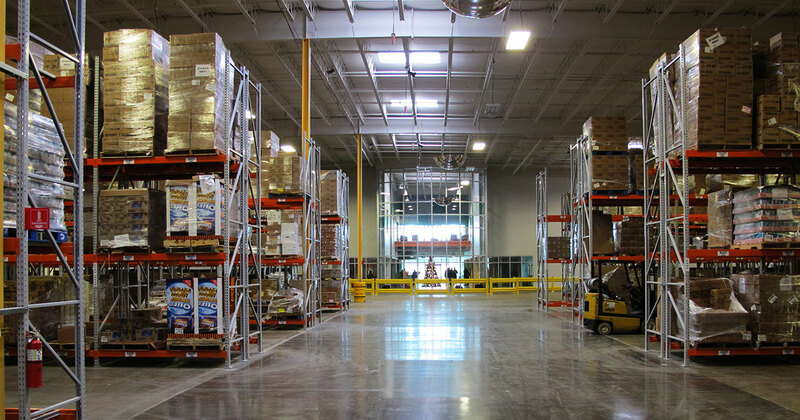 The Mid-Ohio Foodbank is a US Green Building Council’s Leadership in Energy and Environmental Design (LEED) Gold certified building. Our facility earned this certification because it was designed and constructed in a sustainable manner that minimizes the Foodbank’s impact on the environment. 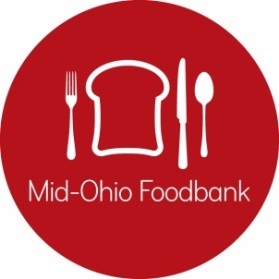 To schedule a tour of the Mid-Ohio Foodbank, please email Gloria McCoy or call 614.317.9453.